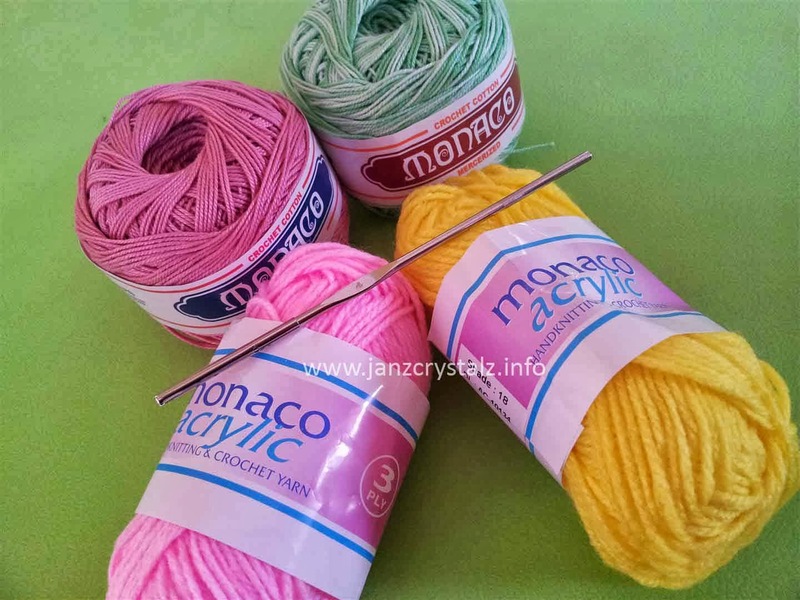 I’ve mentioned in my other blog two months ago that I wanted to learn crochet, because I personally want to make baby accessories made of crocheted yarns. I saw a lot of cute baby stuffs in the net and so determined to make some for our jewel that will be coming in December. Learning from the very beginning was never that easy, because I have to learn the terms and abbreviations to be able to read patterns, which until now I still can’t, I rely mostly on tutorial videos in Youtube which are easier to follow. Materials like yarns and hooks are also something to be familiar with. I have hard time finding hooks here in the city. The ones available are stainless hooks that are only applicable to crochet threads. Yarns have bigger strands that require bigger hooks too. 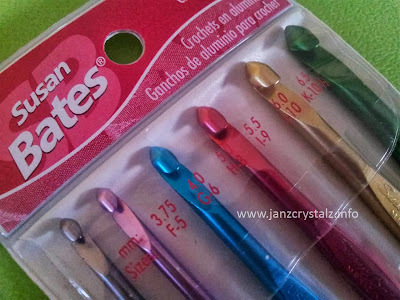 Because I really want to have those big hooks, I searched for them online thru sulit.com and bought myself 1 set of Susan Bates Aluminum hooks at P495.00 + P160 shipping cost. Expensive huh! I know but I have no choice. 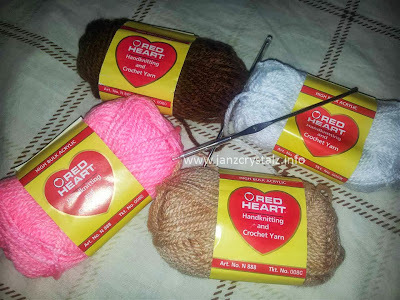 As of for the yarns, local ones like the Red Heart brand are available in Gaisano City, while Monaco Acrylic yarns are available in Everbest, a textile store located in Cogon, Cagayan de Oro City. I think I’ll settle for the local ones for now, when the time comes and will be able to visit Metro Manila I’ll get myself imported yarns of different materials and see the difference. Meanwhile, I still have to continue practicing and reading so that I can really make what I aim to. Mommy Maye is also someone who does crochet. Wow, so many talented individuals in BC Bloggers. Good luck and looking forward to your finished project. A lot of SAHM are into crocheting na ha. My friend who recently give birth to her first child was able to finish a bonnet and a hair band for her little one. So cute. Goodluck on the new found hobby sis. 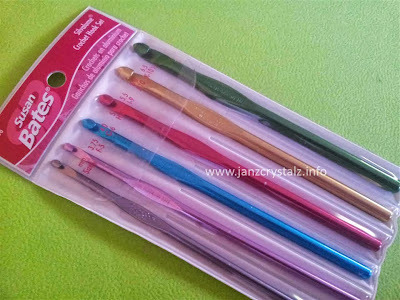 Colorful tools, my aunt is good in crocheting but hindi ko namana yun, starting the project pa lang makes me feel wanting to cry coz hindi ko talaga matatapos. :) Good bluck on your crocheting...Mom Momaye can give you tip, I guess! Looks like you will be very busy at the coming days eh? Crochet is fun and its quite addictive when you start it. Very nice! I wonder if my mom would still be interested in crocheting after she stopped making mantle pieces a long time ago....might be a good gift idea. I agree that crocheting is not that easy especially if you don't have any pattern for a nice project. Dati kami ni Mommy puro patterns lang ang basis ng paggawa, now we can do our own na..just by looking at the photos. 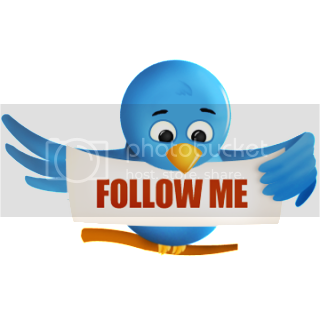 Looking forward for your other creations.